Indian skipper Virat Kohli is undoubtedly one of the greatest batsmen in the cricketing world currently. The Delhi dasher is breaking records with his aggressive batting. Here are some Unknown facts about Kohli. Virat Kohli was born on 5 November 1988 in Delhi to Prem Kohli and Saroj Kohli. Kohli’s father was a criminal lawyer. Virat Kohli’s nickname in the dressing room is “Cheeku”. The first crush of Virat Kohli was the Indian actress Karishma Kapoor. Kohli’s interest in Cricket started when he was a little boy. He joined the West Delhi Cricket Academy at the tender age of 9 to learn the basics of the game. Kohli played a crucial Ranji match in 2006, despite the fact that his father passed away the same day. He scored 90 runs in the match against Karnataka. In 2008, he led the Indian team to victory at the 2008 ICC Under-19 Cricket World Cup held in Malaysia. In 2012, Virat Kohli was included in the list of top 10 “well dressed international men”. Virat dons a Golden Dragon on his forearm, apparently for good luck. Virat Kohli took only 133 innings to score 20 ODI centuries and he is the fastest cricketer to do so. Virat Kohli has scored over 300 runs in a bilateral ODI series on six different occasions. No other player has done it more than four times. Virat Kohli became the fastest player to score 9000 ODI runs during the 3rd ODI against New Zealand in Kanpur. It took Kohli 194 innings to achieve the feat. 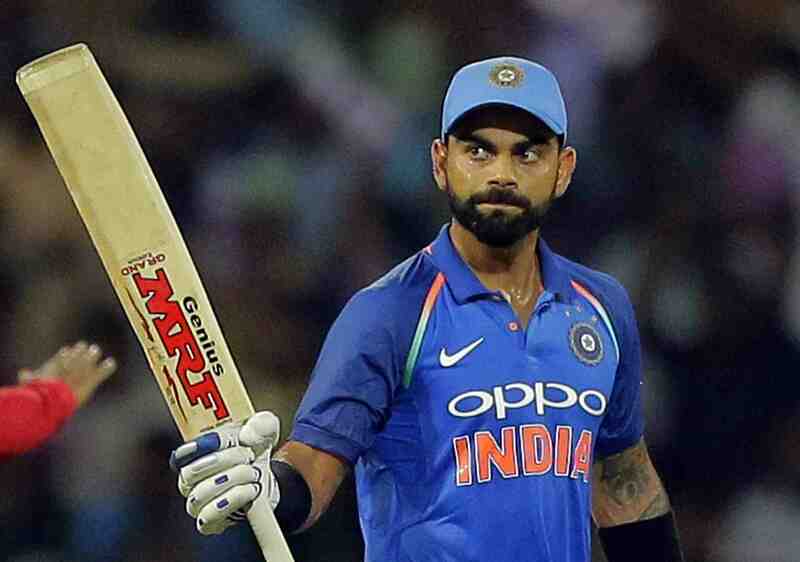 Kohli is the only player to have scored over 15,000 runs at an average of over 50 in international cricket. Kohli received the Arjuna Award in 2013 in recognition of his achievements in international cricket. Kohli is married to Bollywood actress Anushka Sharma. The couple tied the knot last year in Italy.